In the cinema I have always distinguished a quality peculiar to the secret movement and matter of images. The cinema has an unexpected and mysterious side which we find in no other form of art. On 4 March 1948, the body of Antonin Artaud was discovered at the foot of his bed. Before long, French film magazines were inundated with tender obituaries, commemorating his long acting career. Having appeared in more than twenty films between 1924 and 1935, Artaud was a renowned film actor, performing in many of the period’s most influential films including Abel Gance’s Napoléon (1926), Carl Th. Dreyer’s La Passion de Jeanne d’Arc (The Passion of Joan of Arc, 1927), and Fritz Lang’s Liliom (1933). Ironically, Artaud felt humiliated by his film-acting career. He regarded it as a necessary source of income with which to fund his more avant-garde poetry, theatre and film projects. As a writer and critic, Artaud despised the commercialisation of cinema, instead promoting his own radical concept. As this article will reveal, Artaud aimed to change the course of filmmaking and film appreciation. His vision was grand and ambitious, and continues to provoke responses from modern-day critics and filmmakers. However, his polemic is difficult to define precisely because he failed to realise his proposals during his lifetime. Consequently, we must piece together Artaud’s revolutionary film theory from a number of unproduced film scenarios, a handful of essays and scarce interviews. (2) Today, his legacy is evident in film history and alternative filmmaking, marking the potency of his ideas. Artaud rejected ‘pure cinema’, an increasingly popular approach to filmmaking that laid emphasis on the film’s visual form (5), because he considered the approach to be devoid of emotion. Similarly, he considered the hybridisation of literary and theatrical conventions with filmmaking equally abhorrent. Rather, he proposed a cinema that aimed to engulf the spectator, to physically affect them on a subconscious level. Ambitiously, Artaud conceived of a cinematic experience powerful enough to project his viewer beyond their civilised self and rediscover their primitive instincts. Evidently, Artaud’s project significantly deviated from the conventional notion of film fiction. Rather, he theorised a cinematic experience capable of transcending illusion and acting directly upon (and altering) the viewer’s perception of material reality. The alternate realities envisioned by Artaud vary from scenario to scenario. 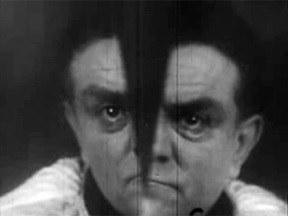 For example, La Coquille et le clergyman (The Seashell and the Clergyman, Germaine Dulac, 1928) inhabits the subconscious mind of an obsessive priest, Les Dix-huits seconds (Eighteen Seconds) dismantles the thought process of a suicidal actor in the moments before he shoots himself, and La Révolte du boucher (The Butcher’s Revolt) presents a savage world free from moral values. Whilst the surface features of Artaud’s scenarios may vary, they share a common subtext, each emerging from Artaud’s distrust of representation. Artaud perceived representation to be the result of a translation, the mental and artistic process that turns ‘raw thought’ into art. However, the primacy of the original thought is lost in its materialisation into (art)efact, and thus becomes de-sensualised. This materialisation of art separates it from the body and distances it from its original conception; consequently, it dies, unable to sustain its sensuality in the physical universe. Ultimately, the act of representation reduces the final (art)efact (be it visual or literary) to an empty shell – a mere tombstone marking its former life. Although Artaud rejected claims that his work was surrealist after Breton had him expelled from the party in 1926, the connections are clear, Breton’s above definition encapsulating Artaud’s film theory. Thus, Artaud’s cinema is a transgressive force, located on the boundaries between materialism and spirituality, between the consciousness and the subconscious, between æsthetic process and artefact, and between fiction and reality. However, the film was made and has become an important (yet imperfect) document of Artaud’s film theory in practice. As Alain Virmaux states: “Whether or not the critics admit it, it clearly bears Artaud’s mark.” (11) As such, an examination of this often overlooked film can still yield insights into Artaud’s forgotten cinema. The controversies surrounding The Seashell and the Clergyman have diminished the importance of the film itself, and it was soon eclipsed by the release of Luis Buñuel and Salvador Dalí’s Un Chien Andalou the following year. Behind Artaud’s conspiratorial tone, there is a truth: namely, that Un Chien Andalou and The Seashell and the Clergyman share a lineage. Although both films employ the techniques that characterise our understanding of surrealist cinema, Artaud’s vision predates Buñuel’s. Yet, Artaud’s importance has been sadly undervalued, especially considering that it was his ideas that became iconic of all subsequent surrealist cinema. The Seashell and the Clergyman penetrates the skin of material reality and plunges the viewer into an unstable landscape where the image cannot be trusted. Remarkably, Artaud not only subverts the physical, surface image, but also its interconnection with other images. The result is a complex, multi-layered film, so semiotically unstable that images dissolve into one another both visually and ‘semantically’, truly investing in film’s ability to act upon the subconscious. Images of Catholicism, identity, corporeality and desire are so intricately interwoven into the subtext of The Seashell and the Clergyman that it is impossible to distinguish the boundaries between them. 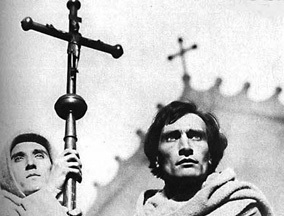 In particular, images of Catholicism prevail throughout the film and are constantly undermined, reflecting Artaud’s contempt of organised religion. With indifference, Artaud abolishes accepted notions of Catholicism and unleashes the repressed sexual desires that lie beneath. He presents us with the image of a priest (played by Alex Allin), an image that connotes celibacy and pious dignity. However, this physical image is subverted when the repressed sexual frustrations of the priest are brought to the surface. His obsession takes the form of a beautiful woman (played by Génica Athanasiou) who appears to him throughout the film like a mirage. According to Sandy Flitterman-Lewis, “it is not a “real” female character […] but an image of the woman, as phantom, as specter, as shadow of desire” (15). The priest’s search for this ethereal image drives the narrative forwards and his growing fanaticism informs the pace of the film. Whilst there is truth in this statement, Kovács underestimates the volatility of the general’s image. Rather, the film presents all corporeality as potentially unstable, and the boundaries that separate the three characters are impossible to locate. In the confessional box, the general sits next to the woman, lecherously listening to her secrets. Consumed with envy, the priest’s sexual frustration reaches boiling point and he attacks the general. Through a series of remarkable effects, where the general’s face is seen to crack and split, the image of the priest transfers, ‘slips under’ that of the general, until he too becomes a priest. The intention is not to present a simple substitution of one image with another (the image of the priest replacing that of the general), but to convey a collision of identity. As the two men fight, touching for the first time, part of the priest’s inner essence merges with the general, their identities ‘slipping under’ one another. Again, this theme is woven into the visual subtext of the film and is established in the opening sequence. The priest pours a mysterious, dark liquid from a large oyster shell into small glass beakers that he drops onto the floor beside him. Near his chair, we find a huge pile of broken glass soaked in the liquid essence, evidence of a hundred broken beakers. The subtext of this image is playing with the double meaning of the word ‘essence’, describing both ‘distilled liquid’ and ‘life force’. 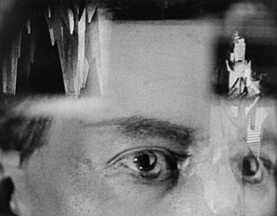 Although this connection is not explicit in the surface images of the scene, Artaud allowed the visual connotation to drift through the imagery of the film. Metaphorically, each beaker contains a single life essence – an identity. When the priest smashes the glass beakers, the inner essence blends and amalgamates. Later, we are presented with a direct reflection of this image when the priest attacks the general and their identities collide. The violent assault causes the general’s face to crack and shatter (paralleling the glass beakers) and the life essence of the priest literally ‘spills over’ into that of the general. Images of corporeality are presented as untrustworthy in the film, liable to alter in response to intense emotional states. Unsurprisingly, this sentiment appealed to the Surrealists, with their interest in the recreation of dream imagery and sublime states of mind in order to access the subconscious self. What Artaud developed was a concrete way of transferring such images to film without a reliance on realist principles. However, The Seashell and the Clergyman much outflanked a cinematic transposition of surrealist techniques, namely the juxtaposition of incongruous images and concepts to express the mechanics of the subconscious mind. Rather, these ideas are swallowed whole and are woven into the very ‘architecture’ of the film. 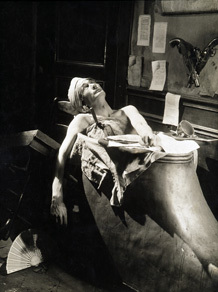 Ironically, it was Artaud’s struggle to overcome representation that accounted for the failure of his theories, but it was also the nature of this struggle that, since his death in 1948, attracted a host of filmmakers and critics to his writing. Artaud’s involvement with cinema raised pertinent questions – questions that today still retain their currency. Artaud challenged base assumptions, questioning the purpose and role of cinema. However, the base assumptions of his own theories were equally suspect. Artaud’s film theory rests on a number of untested premises. First, his proposal is built upon his philosophical beliefs – that behind our perception of material reality exists a metaphysical realm into which the viewer can be projected – an aspect of his thinking that he rarely interrogated. If misguided in this respect, then his film theory collapses. Second, Artaud’s proposal is unachievable without an all encompassing de-commercialisation of the art world and the conventions that surround it – or, more succinctly, the annihilation of all existing art. His proposed revolution was acute, aiming to destroy the (art)efact and the cultural attitudes towards it. Sadly, with the absence of a body of practical work, Artaud’s contribution to film remains in the “asking” rather than the “answering” of these questions. However, Artaud’s “lonely voice” has been heard in the film world and the questions that arose from his proposals still seem relevant. Historically speaking, the lost prophet of cinema has not been entirely forgotten. His fingerprints can still be found. Without Artaud’s contribution, the essence of surrealist cinema would have been very different. Thus, his (failed) work is fundamental to film history, and The Seashell and the Clergyman, where he integrated “Artaudian” principles into the nucleus of the film, stands as a turning point in 20th Century cinema. Antonin Artaud, Collected Works: Volume Three, Paule Thévenin (Ed. ), translated by Alastair Hamilton (London: Calder and Boyars, 1972), p. 65. All of Artaud’s significant writings on cinema were collected and edited by Paule Thévenin in Collected Works: Volume Three for Gallimard, Paris (and published in English by Calder and Boyars). It was the French publication of this edition that fully illuminated Artaud’s contribution to cinema. In considering ‘pure cinema’ in 1925, René Clair noted that: “A film does not exist on paper. The most detailed script could never anticipate every detail in the film’s execution (precise angle of the photographs, lighting, lens-aperture, play of the actors, etc. […]). A film exists only on the screen.” Cited in Jacques B. Brunius, “Experimental Film in France”, translated by Mary Kesteven, in Roger Manvell (Ed. ), Experiment in the Film (London: The Grey Walls Press, 1949), p. 89. Jacques Derrida, Writing and Difference, translated by Alan Bass (London: Routledge, 1978), p. 183. André Breton, Manifestoes of Surrealism, translated by Richard Seaver and Helen R. Lane (Ann Arbor, Michigan: University of Michigan Press, 1972), p. 26. Leo Charney, Empty Moments: Cinema, Modernity, and Drift (Durham: Duke University Press, 1998), p. 124. Stephen Barber, The Screaming Body (London: Creation Books, 2001), p. 9. Alain Virmaux, “Artaud and Film”, translated by Simone Sanzenbach, Tulane Drama Review, 11.1 (Fall 1966), p. 159. It was the film historian and critic Sandy Flitterman-Lewis who noticed this error, but only in the 1980s, many years after the film had been distributed in the wrong order. As she is the authority here, I will quote extensively from her own overview of the events: “for some reason, when the film’s three reels were initially spliced in the U.S., the last reel found its way into the middle of the film, making American prints end with an image of the woman’s severed head inside a glass ball. Both the correct version of the film and the scenario itself end with the clergyman drinking the black liquid from the shell […] William Van Wert’s widely read article, ‘Germaine Dulac: First Feminist Filmmaker’, bases its entire argument on the incorrect sequencing and its mistaken ending.” Sandy Flitterman-Lewis, “Theorising ‘The Feminine’: Woman as the Figure of Desire in The Seashell and the Clergyman”, Wide Angle, 6.3 (1984), pp. 34-5. The incorrectly sequenced version of the film is still widely distributed today and care should be taken when purchasing and/or viewing. Cited in James C. Robertson, The Hidden Cinema: British Film Censorship in Action, 1913–1972 (London: Routledge, 1989), p. 39. Cited in Virmaux, p. 160. Steven Kovács, From Enchantment to Rage: The Story of Surrealist Cinema (London: Associated University Press, 1980), p. 164. For example, in Artaud’s prose poem, “Paul the Birds or the Place of Love”, Artaud fantasises about his identity merging with that of Paolo Uccello, a Florentine Renaissance painter. In the text, Artaud is disorientated, unclear about where his body ends and where Uccello’s begins: “Paolo Uccello, cast away your tongue, my tongue, my tongue, dammit, who said that, where are you?” Antonin Artaud, Collected Works: Volume One, translated by Victor Corti (London: Calder and Boyars, 1968), p. 52. Germaine Dulac, “The Expressive Techniques of the Cinema”, translated by Stuart Liebman, in Richard Abel (Ed. ), French Film Theory and Criticism Volume 1: 1907-1939 (New Jersey: Princeton University Press, 1988), p. 312. Sandy Flitterman-Lewis, “The Image and the Spark: Dulac and Artaud Reviewed”, in Rudolf E. Kuenzli (Ed. ), Dada and Surrealist Film (New York: Willis Locker and Owens, 1987), p. 112.